Europe’s future depends on its youth. Promoting youth participation is fundamental in the EU policy. Especially for environmental issues, the participation of young people in decision making is extremely important, as decisions taken now on matters such as climate change, the depletion of resources, and the loss of biodiversity will have long-term consequences that will affect the future generations. Young people will have to live longer with the consequences of current decisions, and have special concerns and responsibilities in relation to the environment. The concept of public participation is also a fundamental principle in environmental law, while the Aarhus Convention (signed by the European Community and its Member States in 1998) gives the public the right to obtain information on environmental issues and participate in decision-making. However, according to recent findings of the Eurobarometer, half of the young people tend to distrust the European Union. Traditional channels of representative democracy, such as voting at elections and joining political parties, only partially stimulate young people’s interest in active participation. In this light, STEP aims to motivate young people to participate in decision making in environmental issues. 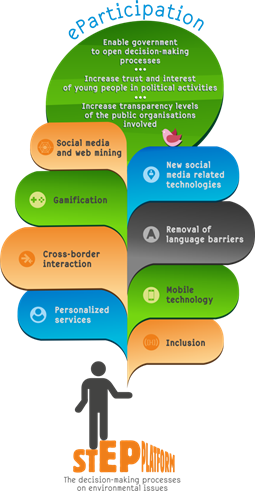 The main component of STEP will be an eParticipation platform which will facilitate the interaction between policy makers and young people, combining trend spotting and foresight with idea creation and innovation management, and will enable policy makers to analyse and discover new insights, based on well proven analytical methods.